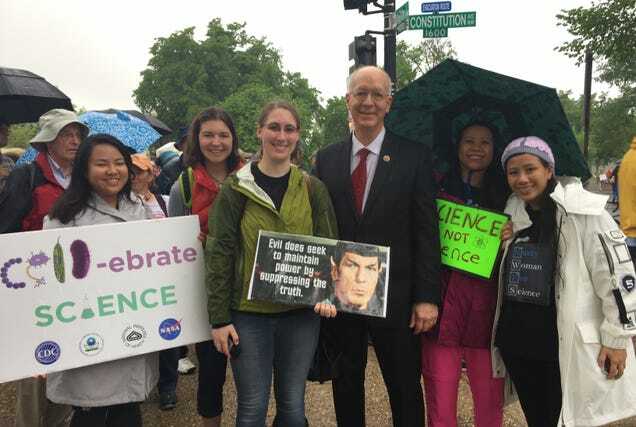 WASHINGTON, D.C.—On a day when tens of thousands of people crowded the National Mall in Washington, D.C. to march for science, a Congressman who can boast the only science PhD on Capitol Hill is something of a celebrity. “It’s as close as I come,” Bill Foster told me. “When I go into the crowd, I get recognized quickly. I’ve done some number of selfies.” Foster is a physicist (he spent more than two decades at Fermilab), and represents the 11th district of Illinois, which includes Argonne National Laboratory, among other scientific facilities. We escaped the rain and his adoring fans into a hotel lobby for an hour on Saturday before the march itself got started, to talk about one of his favorite topics: bringing more people with scientific and technical expertise into elected office. Of course, “strong technical competence” is not a great description of Washington these days. The march itself was conceived as a response to some the most impressively anti-science attitudes we’ve seen ascending to the White House, where the new administration has already begun to do damage to everything from pesticide regulation to climate change mitigation. But Foster thinks the primary assault on science is budgetary. The Trump administration’s “skinny budget” proposes cuts to scientific programs across the board, from climate research to NIH funding, and enacting these would have implications far beyond the four or eight (or one or two?) years Trump spends in office. Starting at lower levels may be the way to go for most scientists looking to enter the policy arena, in school boards or city councils, or even mayoral races. Funding barriers are lower there, and having a deep bench of science-minded people with any campaign or public service experience would set the stage well when the next federal seats open up. “They will be facing a primary challenge if they vote the way their brain tells them to,” he added. This shouldn’t have shocked me—obviously many in the GOP understand climate change just fine—but it did. Foster said he sympathizes with their dilemma and added that the public needs to be better informed to fix the problem. But he didn’t seem to have much faith in those members of Congress educating their constituents—if they understand the issue, and the public needs to understand it, shouldn’t it be incumbent on our elected officials to inform rather than capitulate? As long as much of Congress is filled with cowardice, it falls to citizens who do understand science to speak up, or to run for office themselves. “When scientifically false statements are made by people who know better, then it is the duty of every scientist and citizen that supports the truth to stand up and shout ‘Garbage!’” Foster said. In science, Foster pointed out, standing up and saying something that you know to be untrue would end your career. There was a time when this was also true for politics—he cited Joe Biden’s repurposing of a speech without citation, which helped kill his 1988 presidential campaign—but clearly today, we’re so far through the looking glass that 1988 may as well be Lewis Carroll’s England. And with that somewhat dark warning, we finished up and he was back out into the rain, to march—but not before taking one more picture with fans at the next table. Dave Levitan is a journalist, and author of the book Not A Scientist: How politicians mistake, misrepresent, and utterly mangle science—available now! Find him on Twitter and at his website.